THE GODFATHER: Popularly viewed as one of the best American films ever made, the multi-generational crime saga The Godfather (1972) is a touchstone of cinema: one of the most widely imitated, quoted, and lampooned movies of all time. Marlon Brando and Al Pacino star as Vito Corleone and his youngest son, Michael, respectively. It is the late 1940s in New York and Corleone is, in the parlance of organized crime, a “godfather” or “don,” the head of a Mafia family. Michael, a free thinker who defied his father by enlisting in the Marines to fight in World War II, has returned a captain and a war hero. 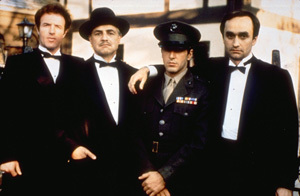 Having long ago rejected the family business, Michael shows up at the wedding of his sister, Connie (Talia Shire), with his non-Italian girlfriend, Kay (Diane Keaton), who learns for the first time about the family “business.” A few months later at Christmas time, the don barely survives being shot by gunmen in the employ of a drug-trafficking rival whose request for aid from the Corleones’ political connections was rejected. After saving his father from a second assassination attempt, Michael persuades his hotheaded eldest brother, Sonny (James Caan), and family advisors Tom Hagen (Robert Duvall) and Sal Tessio (Abe Vigoda) that he should be the one to exact revenge on the men responsible. After murdering a corrupt police captain and the drug trafficker, Michael hides out in Sicily while a gang war erupts at home. Falling in love with a local girl, Michael marries her, but she is later slain by Corleone enemies in an attempt on Michael’s life. Sonny is also butchered, having been betrayed by Connie’s husband. As Michael returns home and convinces Kay to marry him, his father recovers and makes peace with his rivals, realizing that another powerful don was pulling the strings behind the narcotics endeavor that began the gang warfare. Once Michael has been groomed as the new don, he leads the family to a new era of prosperity, then launches a campaign of murderous revenge against those who once tried to wipe out the Corleones, consolidating his family’s power and completing his own moral downfall. Nominated for 11 Academy Awards and winning for Best Picture, Best Actor (Marlon Brando), and Best Adapted Screenplay, The Godfather was followed by a pair of sequels. THE GODFATHER PART II: This brilliant companion piece to the original The Godfather continues the saga of two generations of successive power within the Corleone family. Coppola tells two stories in Part II: the roots and rise of a young Don Vito, played with uncanny ability by Robert De Niro, and the ascension of Michael (Al Pacino) as the new Don. Reassembling many of the talents who helped make The Godfather, Coppola has produced a movie of staggering magnitude and vision, and undeniably the best sequel ever made. Robert De Niro won an Oscar®; the film received six Academy Awards, including Best Picture of 1974. 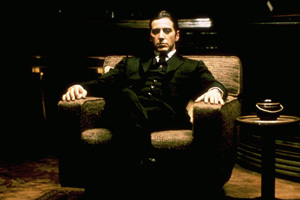 THE GODFATHER PART III: One of the greatest sagas in movie history continues! In this third film in the epic Corleone trilogy, Al Pacino reprises the role of powerful family leader Michael Corleone. Now in his 60’s, Michael is dominated by two passions: freeing his family from crime and finding a suitable successor. That successor could be fiery Vincent (Andy Garcia)… but he may also be the spark that turns Michael’s hope of business legitimacy into an inferno of mob violence. Francis Ford Coppola directs Pacino, Garcia, Diane Keaton, Talia Shire, Eli Wallach, Sofia Coppola, Joe Montegna and others in this exciting, long-awaited film that masterfully explores the themes of power, tradition, revenge and love. Seven Academy Award® nominations, including Best Picture. Take advantage on this AWESOME deal for it won’t last long. Stock up on holiday presents, birthdays, or a special gift for yourself. 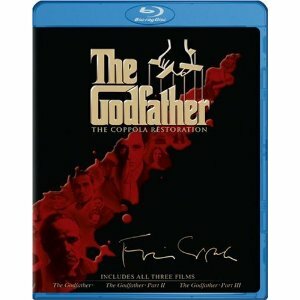 $49.99 for all Godfather films. This entry was posted on Monday, June 13th, 2011 at 11:00 am	and is filed under Film, News. You can follow any responses to this entry through the RSS 2.0 feed. You can skip to the end and leave a response. Pinging is currently not allowed. « Who Is Ready For The Country, Ya’ll?